The stem cells of fruit flies and the behaviour of slime mould are among the unusual inspirations for work featuring in the newest exhibition at the University of Dundee’s LifeSpace Science Art Research Gallery. ‘Seeing through the see-through’ opens at LifeSpace on Thursday, 29th October and features work created through its first artist-in-residence programme. Mat Fleming, a filmmaker and artist based in Newcastle, has been traveling to Dundee regularly over the past seven months to undertake a residency funded by the Leverhulme Trust within the prestigious Dundee Imaging Facility at the University’s School of Life Sciences. Working with varied scientific source material, the artist has reflected on the aesthetic decisions scientists make in the creation of images. The exhibition showcases the work he created during the residency, including film, animations, and printed work, that reflect the transition from film to digital techniques in the area of microscopy. Sarah Cook, curator of the exhibition at LifeSpace said, “I’m hoping that this exhibition will generate discussion about scientific imaging, about art, and about how we see things differently when we bring artists and scientists together. “I was very keen for Mat to work with the microscopy unit here in Dundee as his incredibly sensitive and skilled abilities in hand-processing film showcase an aesthetic which is increasingly being lost in our digital age, and allows the reintroduction of some of the magic of image-making. “It’s not that one is better than the other, but making images on celluloid film and making images with digital data are different qualitative processes, and we easily forget earlier processes when we learn new tools. 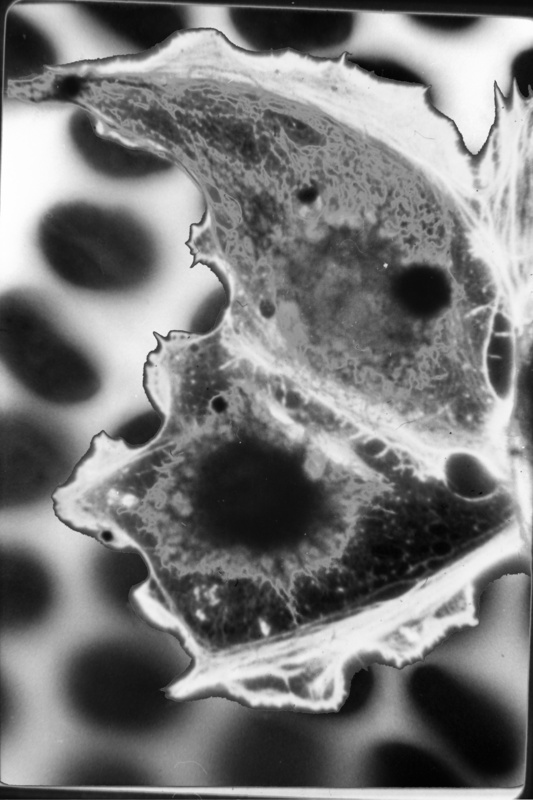 “Whilst scientists’ use of imaging technology and the tools of microscopy are a means to an ends in scientific research, they have nevertheless relied on a long history of ingenuity or inventiveness in order to take pictures of that which is mostly invisible because it is at such a tiny scale, the material being looked at is see-through, or because light might kill the sample being examined. Digital imaging techniques have hugely changed the field of microscopy from its origins in the 15th century to today. The exhibition looks at a key moment of transition in the field, bringing back to light film and hand-developed photographs, and applying hand drawing techniques to reinterpret digital images. Working with archival material from the work of Dr Alan Prescott, originally printed on film and glass plate negatives, the artist re-photographed ‘micrographs’ (microscope images) and produced them in black and white prints, and lenticular form – so that numerous images are captured within a single frame and they appear to move as the viewer walks past them. Dr Sam Swift, director of the Dundee Imaging Facility said, “Imaging and Technology have always been central in our approach to engaging the public and developing inter-disciplinary collaboration. The exhibition also includes objects from the University of Dundee Museum collections which illuminate moments in the history of microscopy, from original slides of samples collected by Professor D’Arcy Thompson, to a View-Master stereoscope from the 1960s that allowed 3D photographs of the inside of a human body to be created.